Simon Says Give, which is run locally by 14-year-old Simon Eber, donated backpacks full of back-to-school supplies to students at Woodland Academy and Columbus Park. 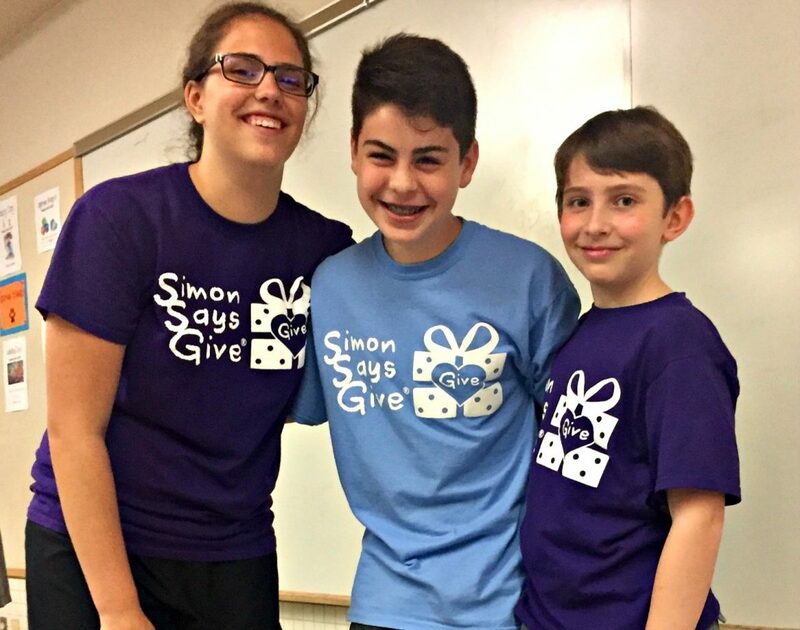 Simon Eber, 14, is the kid president of the Worcester chapter of Simon Says Give, which provides students in need with birthday celebrations and school supplies. “Simon Says Give in Minnesota started the High Five for Supplies campaign, and when I learned more about it, I realized that it would be a great way to help other children in Worcester Public Schools,” Eber said. After starting the Worcester chapter of the Minnesota-based nonprofit earlier this year, Eber has donated more than 168 backpacks filled with school supplies and celebrated two birthdays since April. 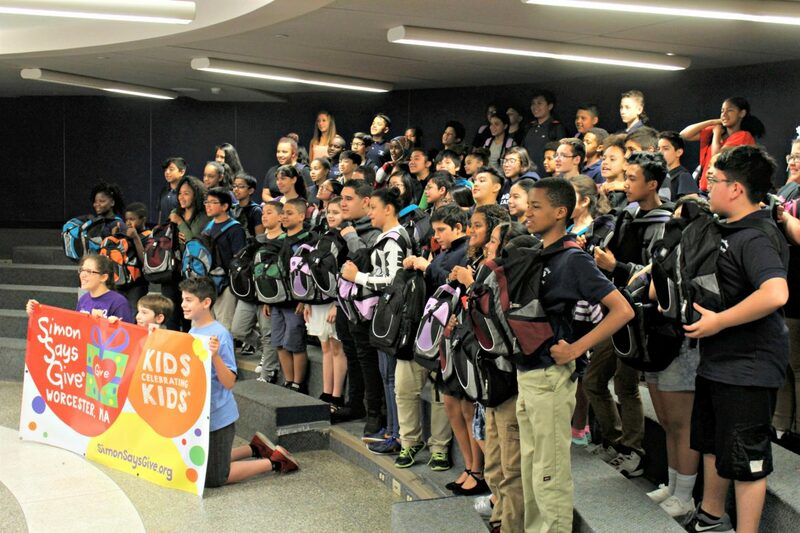 Some 120 of those backpacks were delivered to Woodland Street Academy and Columbus Park last Thursday and presented to the graduating sixth-grade classes. Each backpack, filled with back-to-school supplies including calculators and binders, were given to students, many of whom are facing financial hardship. About 70 percent of the students attending Woodland Academy and Columbus Park are considered “economically disadvantaged” according to state education statistics (district-wide the number is 57 percent). Launched in 2012 and with branches in Minnesota, South Dakota and Massachusetts, the organization has donated more than 10,000 backpacks nationwide. Mandi Simon, 13, founder of the Simon Says Give organization, and Nolan Fleming, 11, kid president of the South Dakota chapter, joined Eber in presenting the Woodland Academy and Columbus Park students with backpacks. With more than 70 students in attendance for the presentation at Woodland Academy, the feeling of inspiration was contagious. Many of the students questioned how they could become involved with the organization. “I started by donating my own money,” Eber said. After realizing the challenges of establishing and registering a nonprofit in Massachusetts, Eber knew he had to be the initial spark of change. During the summer, Eber plans to continue his fundraising efforts through events at Staples and other local businesses. Simon Eber, center, poses with fellow leaders Mandi Simon, left, and Nolan Fleming. “Dave Fisher, a local businessman, overheard Simon pitching the manager at Staples to host a supply drive and he approached Simon and said he would donate money to his cause,” said Jim Eber, Simon’s dad and “adult leader” for the Simon Says Give Worcester chapter. This year, Eber’s chapter donated backpacks to three Worcester Public Schools: Woodland Academy, Claremont Academy and Midland Street School.